VIVE gives you an unparalleled, true-to-life virtual reality experience. Using a headset and wireless controllers, you can explore and interact with VR experiences, apps and games that blur the line between imagination and reality. From AAA games to unforgettable experiences, there are over 2500 apps and games available for VIVE. 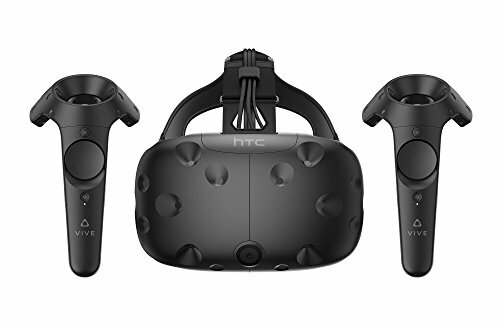 FREE CONTENT WITH PURCHASE - Fallout 4 VR plus a two month free trial of Viveport Subscription included with your purchase. PRECISION MOVEMENT TRACKING - 360-degree controller and headset tracking covers your movements to the millimeter, floor-to ceiling. FLEXIBLE PLAY AREA - Room-Scale VR with just two base stations. Use VIVE seated, standing or in a space up to 15 feet x 15 feet. POWERED BY STEAM VR - Enjoy over 2500 games for SteamVR, plus everything you love about Steam, including new releases, automatic game updates and millions of your closest friends, in VR.